Home/Artist Pieces, Events, Q&A with the Artists/Domo Arigato, Mr. Suiko! Mike Bam‘s show “Fast Forward” has pulled great artists from across the globe. One of the show stoppers is Suiko1, heralding from Hiroshima, Japan. He graced us with his presence at the opening and since it was his first time in San Francisco, Bam showed him how the Bay Area rolls. In the middle of a painting sesh, Bam asked Suiko some questions about his funk, steez and swag. Mike Bam: I was very attracted to your style in the Rakgaki book back in 2006 even though I could not read it. Can you explain what your style is? Suiko: I don’t paint American or Roman letters. My graffiti style consists of painting Japanese Kanji characters. However, similar to how American graffiti lettering is based off the Roman alphabet, the styling that I paint is based off of the Kanji alphabet. You will not understand or be able to read my style if you don’t know Japanese Kanji and for many that know Kanji, they still may not be able to read my Kanji style depiction. M: I noticed that over the past 2 years, I see hints of characters or animals mixed in with your Kanji lettering. Is this what you’re mixing? S: Yes, I like certain animals and you are correct in seeing the mix of animals with my Kanji lettering. I usually paint creatures from the Japanese culture (like sea life or a bird). I like painting animals, but I don’t paint animals or characters in the same style that you do with that perfect airbrushed rendering. I mix it up by incorporating my lettering style with the image of an animal. M: We just watched Planet B-Boy together & had a great, engaging discussion about the difference on spraycan/street artists that paint full time (and don’t go to an office job) everyday. Can you explain how you became a full time artist? S: I was about to finish at my university and I had the opportunity to go to Germany to do an exchange in the last semester of schooling. At this time, I was not a graffiti artist. When I got to Germany in 1999, I was introduced to graffiti art. I loved it so much, I picked it up and started painting everyday instead of going to classes. Instead of studying, I collected my monthly allowances and chose to paint everyday. I had such a blast! Since then, I have not stopped. It was in Germany that I decided that I needed to paint spray can art everyday instead of going to a graphic design office job. I agree with the Bboys from Japan that once you follow your passion and do it everyday, you will have found your identity. M: As a fine artist of spray can art or graffiti, there must be some commercial gigs or jobs that you do. 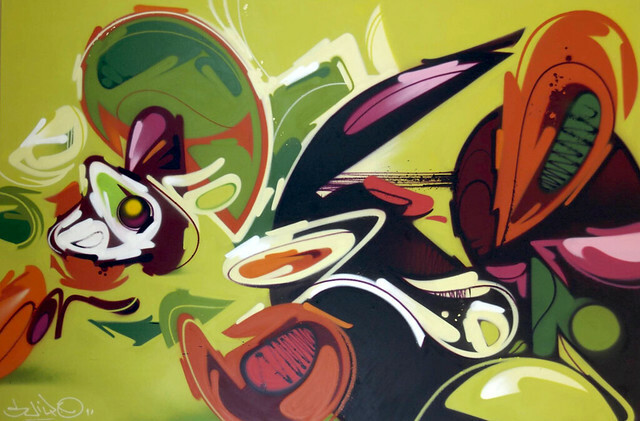 How do you determine the paying jobs that you do with graffiti art? S: I choose clients that want my style of art. If they don’t want my style, then I don’t take on the job. For example, I am currently doing a job for a Jeep/Dodge Ram dealership in Hiroshima. I proposed to Jeep/Dodge that I could do their mascot of the Dodge Ram in my “Suiko Style” and they accepted that. This is a perfect marriage of painting something I want to in my style and completing a commercial job using graffiti art. M: Thank you for answering my questions! S: You’re welcome! Please visit Hiroshima anytime and lets paint! Check out Suiko’s work in “Fast Forward”, now up at 1AM gallery through October 29th. If you want to learn more about him, visit www.suiko1.com.